AOI SHIMOSAKA: AOI SHIMOSAKA made KO-MOKUME. |______________ KEI-AN YASUSADA: MOKUME. Can be KO-MOKUME. (MUSASHI) (YAMATO no KAMI) KO-NIE and ASHI. Some deep KAERI. from ECHIZEN. He received "Yasu" from Tokugawa Iyeyasu and became Yasutsugu. They came together at Fukui in Echizen under the patronage of Honda Narishige. institute the Higo Daijo group in making swords there with 40 Koku. summoned his son's loved sword-maker, Shimosaka and awarded him his own "Yasu"
1621, 9th month, 9th day. Made long swords, Wakizashi Dambira, Tanto, Shinogi-Tsukuri Katakiriba-Tsukuri. Boshi can show Togari with Hakikake and Nie Kuzure of Kaen Boshi with Ko-Maru. GENWA KUNEN 1623, after the death of YASUTSUGU(1), he moved permanently to EDO. ARA-NIE. NIE in ICHINOSUKE can be KO-NIE. generation uses a KAKU squared TSUGU. First generation did not use SAKU KORE. appear in the style of the 2nd. Work of the second Yasutsugu. 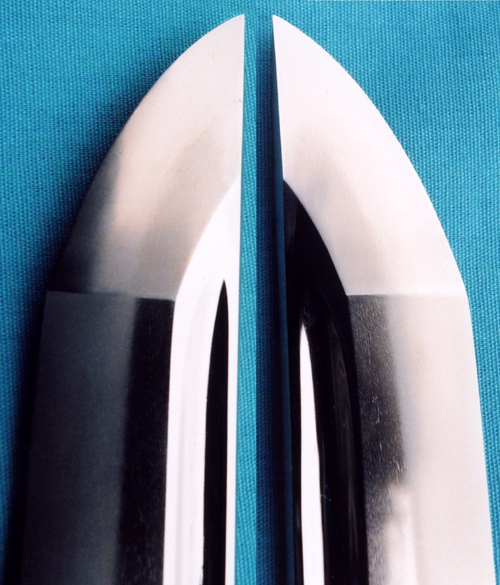 Hira-Tsukuri, wide blade with shallow Sori. Notare has Soshu style O-Midare Ba of Gunome Kuzure where Sunagashi and Kinsuji strafe at figures. Saagari Ko-Maru Boshi with long Kaeri. Ubu Yamagata Nakago has two Mekugi-ana. Hira-tsukuri, Mitsu-Mune, wide with shallow Sori. Ko-Itame Hada with thick Ji-Nie. Notare Gunome-Midare mix in Nioi-Fukashi and Ko-Nie with Sunagashi and Kinsuji. Midare-Komi Saagari Boshi has Togari with Hakikake and a long fall Kaeri. Ubu Kengyo Nakago with -no- Mekugi-ana. Shinogi-Tsukuri, Omote with Katakira, Ura. Ihori-Mune, shallow curve to O-Kissaki. 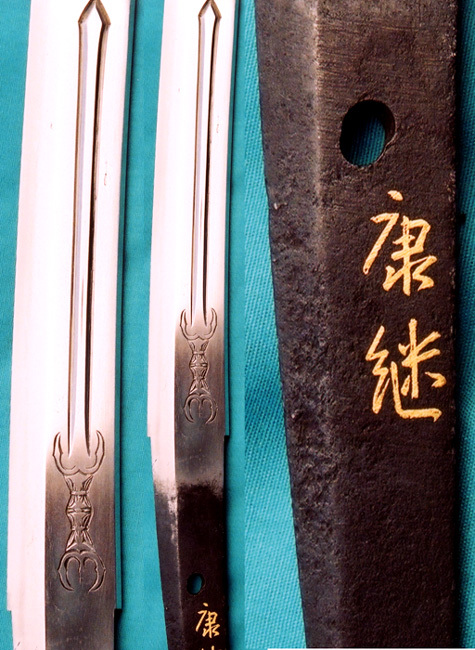 Ura: Futatsu-bi in the upper, Bonji, Rendai and Kuwagata in the mid and Suken Koshi-Hi. Tight Itame Hada that runs. Masame along the Mune. With Ji-Nie and Chikei. Omote is Notare Gunome mix to Chu-Suguha in the lower. Ura is Gunome, O-Gunome-Midare spreading across the Ji in the upper and falling to Chu-Suguha in the lower. Tobi-Yaki, Ara-Nie, Kinsuji and Sunagashi on both sides. Mune-Yaki. Midare-Komi Boshi has Hakikake and long Kaeri. Tokugawa Hollyhock Mon and the Honda Standing Hollyhocks. Shinogi-Tsukuri, Ihori-Mune, wide, shallow curve to O-Kissaki. Running Itame Hada has Masame in the Shinogi-Ji. Mura Ji-Nie and Chikei on dark steel. Powerfully billowing O-Midare Choji Ba fills the Ji. Ashi and Yo find Sunagashi and Tobi-Yaki pulling Kuzure figures apart. Kinsuji in Nioi-Fukashi and Ara-Nie that is Mura. Hiro-width Midare-Komi Boshi has Togari with long fall. 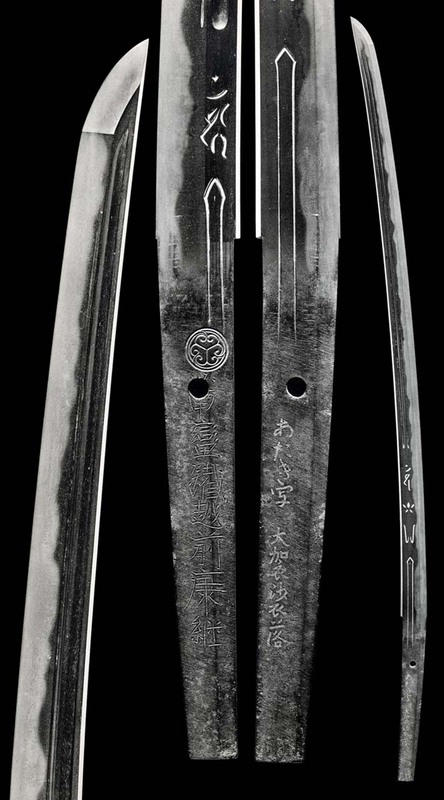 A reproduction of Toraki Sadamune Shoto, a gift to Iyeyasu from Nagasaka Sarikuro. Ko-Itame Hada with Masame along the Mune. Running Hada has Chikei and profuse Ji-Nie spreading across the Ji. A wide, tumbling Notare Hamon of Gunome-Midare mix with deep Ashi and Yo in clear and shining Nioi-Fukashi and profuse Ko-Nie. Sunagashi sweeps figures. Mune-Yaki extends into the Ji-Nie from the back. Midare-Komi Boshi has Tsuki-age Omote and Yaki-Kuzure, Togari turn on Ura. Long falling Kaeri runs to Mune-Yaki. Another after Toraki Sadamune no Utsushi. Ura: Bonji as Kurikara on Vajra Ken. Itame Hada that runs, and there is thick Ji-Nie. A billowing Notare has Gunome-Midare Ba with Ashi that is wider in the upper. In clear Nioi-Fukashi and Ko-Nie. Kinsuji all along. Midare-Komi Boshi has Ko-Maru and long fall Kaeri. Ubu Kengyo Nakago has two Mekugi-ana. Both have seen many mounts. 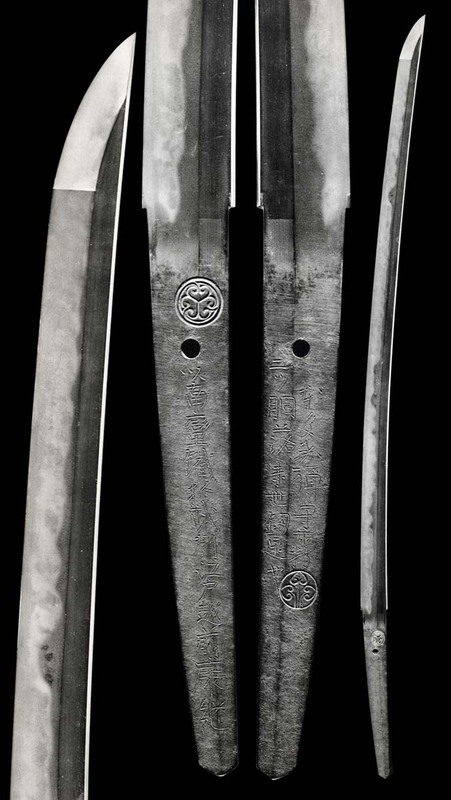 Shinogi-Tsukuri, Mitsu-Mune, wide blade and shallow curve. Very fine Itame Hada with Ji-Nie. 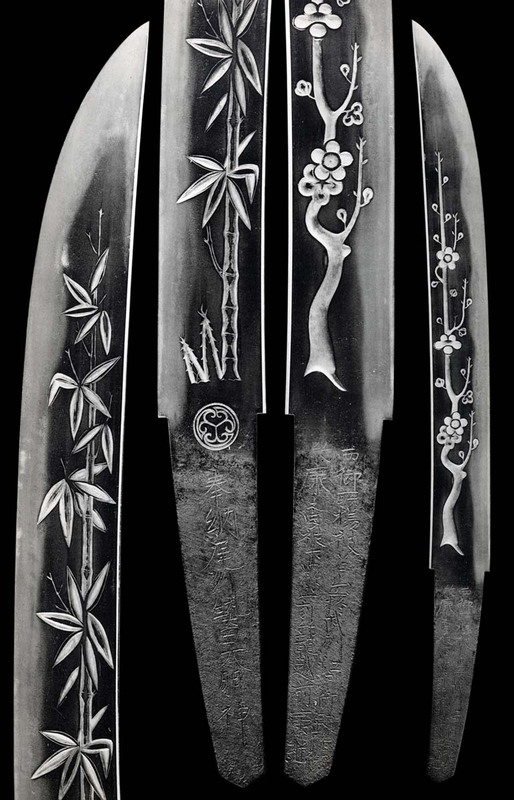 Hiro-Suguha with gentle Asaki-Notare holds Ko-Gunome-Midare with Ashi. In Clear Nioi and Mura Ko-Nie. Sunagashi streams through figures. Ko-Maru Boshi with Tsuki-age on Ura falling to deep Kaeri and Mune-Yaki. Ubu Yamagata Nakago has two Mekugi-ana. Top is drilled twice. 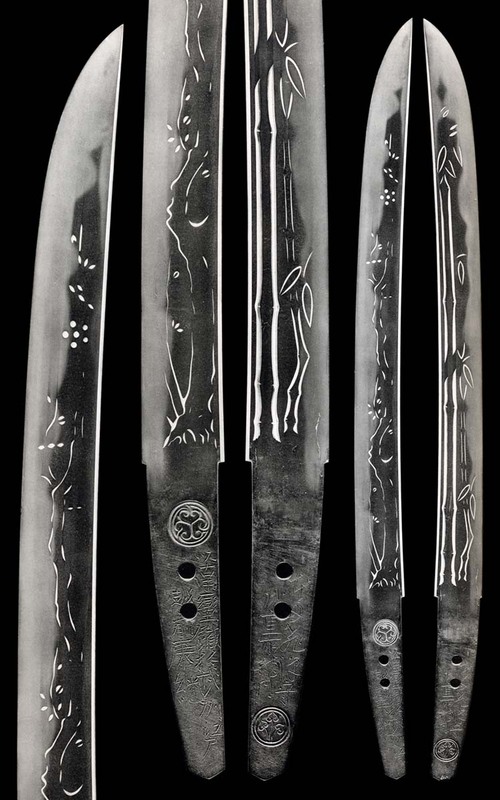 Shinogi-Tsukuri, Ihori-Mune, wide blade, hallow curve, O-Kissaki. Strong Itame Hada with Masame in the Shinogi-Ji Ji-Nie. High rising Choji Gunome O-Midare Ba with Togari spires and Ashi and Yo. Tobi-yaki and Mune-Yaki abound. In Clear Nioi and Mura-Nie. Sunagashi brings Nijuba in places. O-Midare Boshi has Tobi and deep falling Kaeri. Ubu Yamagata Nakago has one Mekugi-ana. Top is drilled twice. In the Soshu style after Sadamune. Running and defined Itame Hada has Ji-Nie and Chikei. 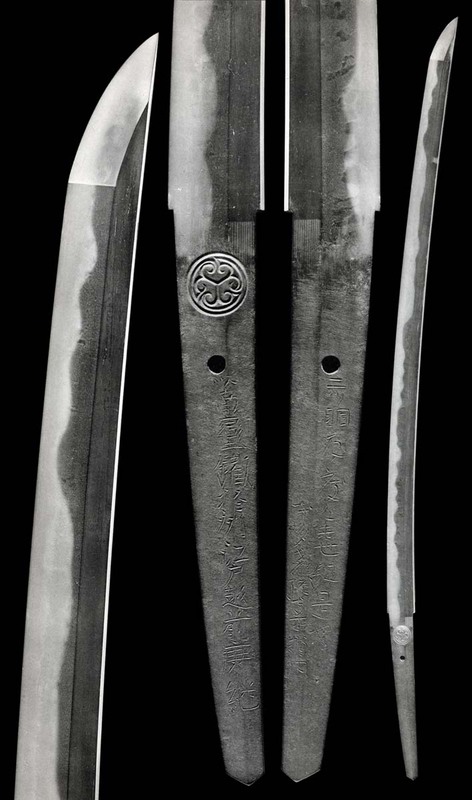 Shinogi-Tsukuri, Kiriba-Tsukuri, Ihori-Mune, wide blade, shallow Sori to elongated Chu-Kissaki. Ura: Futatsu-Hi, Bonji Rendai and Kuwagata, and Suken in the Koshimoto. O-Midare with Gunome and Tobi-Yaki sread across the Ji. Sunagashi sweeps billowing figures, Nie becomes Ara and Kinsuji insists all along. Omote Boshi is Ichimae where Ura is very full, Saagari with Tobi-Yaki and Tsuki-age turn to deeply falling Kaeri. 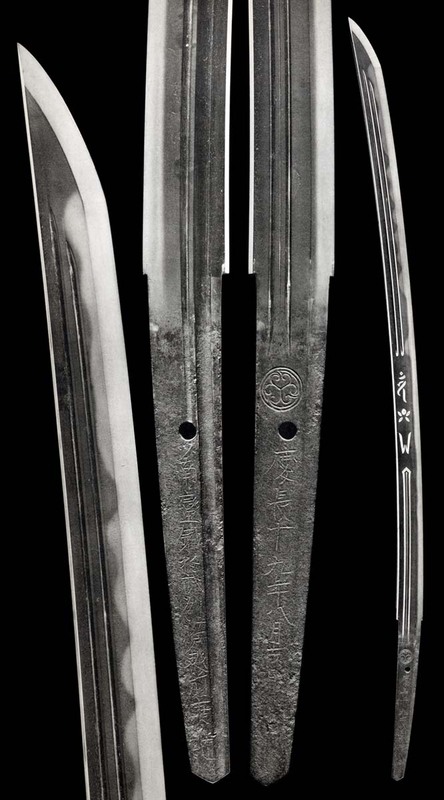 Suriage Kirijiri Nakago has one Mekugi-ana. 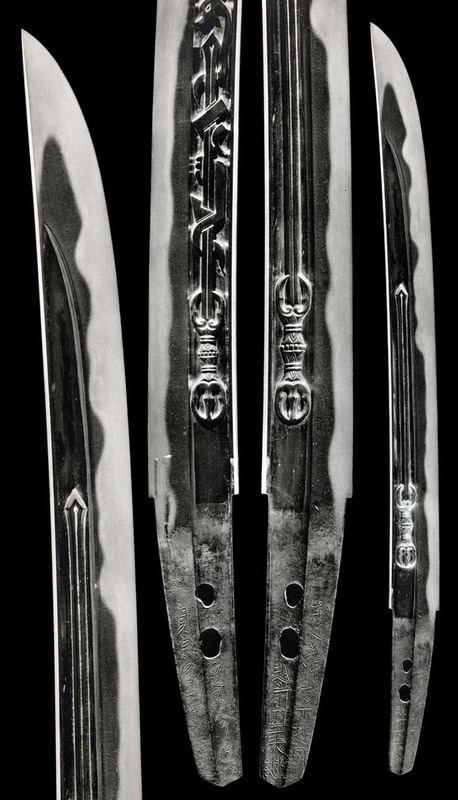 Shinogi-Tsukuri, Ihori-Mune, Shinogi-taka raised to Chu-Kissaki. Bo-Hi both sides, Maru-Dome resolve. Strongly standing Itame and Mokume Hada Ji-Nie, has O-Hada. Ko-Nie Deki and clear Nioi Hiro-Suguha on a gentle Asaki-Notare roll. Hamon has Ko-Gunome with Ashi within. Sugu Komaru Boshi with small Kaeri. Standing and running Itame Mokume Hada has Ji-Nie. Evenly matching Toran Ba style O-Midare Ba with striating Nie Sunagashi sweeping figures. Nie becomes Ara and there is Kinsuji. with Sunagashi and Hotsure striating. In Nioi-Fukashi and Powder Ko-Nie.